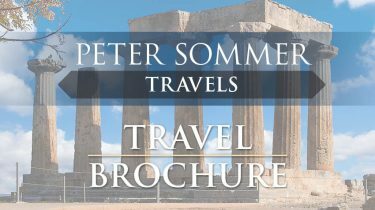 The following Booking Conditions together with the General Information contained in our brochure and website form the basis of your contract with Peter Sommer Travels Ltd. Please read them carefully as they set out our respective rights and obligations. By asking us to confirm your booking, we are entitled to assume that you have read these booking conditions and agree to them. Except where otherwise stated, these booking conditions only apply to holiday arrangements which you book with us in the UK and which we agree to make, provide or perform (as applicable) as part of our contract with you. All references in these booking conditions to “holiday”, “booking”, “contract”, “package”, “tour” or “arrangements” mean such holiday arrangements unless otherwise stated. In these booking conditions, “you” and “your” means all persons named on the booking (including anyone who is added or substituted at a later date) or any of them as the context requires. “We”, “us” and “our” means Peter Sommer Travels Ltd.
A deposit is required in order to confirm your chosen holiday. The first named party on the booking (‘lead booker’) is responsible for making all payment due to us. You will be informed of the deposit amount and payment schedule required at the time of booking but the balance of the cost must be paid at least 10 weeks before the scheduled start of your tour. If booking 10 weeks or less from the scheduled start, payment must be made in full. If we do not receive all payments due in full and on time, we are entitled to assume that you wish to cancel your booking. In this case, we will be entitled to keep all deposits paid or due at that date. If we do not cancel straight away because you have promised to make payment, you must pay the cancellation charges shown below depending on the date we reasonably treat your booking as cancelled. The lead booker must be authorised to make the booking on the basis of these booking conditions by all persons named on the booking and by their parent or guardian for all party members who are under 18 when the booking is made. By making a booking, the lead booker confirms that he/she is so authorised. The lead booker must be at least 18 when the booking is made. Subject to the availability of your chosen arrangements, we will confirm your holiday by issuing a deposit receipt. The deposit receipt will be sent to the lead booker. Please check the deposit receipt carefully as soon as you receive it. Contact us immediately if any information which appears on the deposit receipt or any other document appears to be incorrect or incomplete as it may not be possible to make changes later. We regret we cannot accept any liability if we are not notified of any inaccuracies (for which we are responsible) in any document within ten days of our sending it out. We will do our best to rectify any mistake notified to us outside these time limits but you must meet any costs involved in doing so. A binding contract between us comes into existence when we despatch our deposit receipt to the lead booker. We both agree that English Law (and no other) will apply to your contract and to any dispute, claim or other matter of any description which arises between us (except as set out below). We both also agree that any dispute, claim or other matter of any description (and whether or not involving any personal injury) which arises between us which cannot be settled directly must be dealt with under the ABTA Dispute Settlement Service (see below) or within the jurisdiction of the Courts of England and Wales only unless, in the case of Court proceedings, you live in Scotland or Northern Ireland. In this case, proceedings must either be brought in the Courts of your home country or those of England and Wales. If proceedings are brought in Scotland or Northern Ireland, you may choose to have your contract and claim governed by the law of Scotland/Northern Ireland as applicable (but if you do not so choose, English law will apply). Our tours by their very nature involve a significant amount of walking as well as scrambling over rough terrain on archaeological sites (which are frequently rugged and with loose rocks underfoot), often in hot and humid climatic conditions, This can make them difficult to negotiate and physically tiring. Your physical fitness should therefore be of a level that will allow you to get the most from the chosen tour. If you walk regularly and have no problem ascending or descending flights of stairs, then you should have no problem on these tours. If you are not comfortable with such routine exercise, or would accomplish it only with great effort or at a slow pace, then these tours may not be suitable for you. It is the responsibility of the individual tour members to decide whether they are medically fit and able to undertake one of our tours. If you have any reservations regarding your fitness for a trip please contact us for further advice. Under no circumstances should you travel if your doctor has advised you against it, or would advise you against it if consulted. If we reasonably feel unable to properly accommodate the particular needs of the person concerned, we must reserve the right to decline their reservation or, if full details are not given at the time of booking or the condition / disability develops after booking, cancel when we become aware of these details. Once on the tour, it is up to us to determine if your level of fitness is sufficient to tackle the challenges presented by each day’s activities. Bookings are accepted on the understanding that they appreciate the possible risk inherent in such cultural travel and that they undertake our tours walks or cruises on that basis. It should also be noted that as we travel very often to remote destinations, the general levels of comfort and services may be lower than would be found in the UK. You agree to accept the authority and decisions of our employees, Trip Leaders and agents whilst on trip with us. If in the opinion of any such person(s) or any other person in a position of authority (such as, for example, an airline pilot or hotel manager), your health, level of fitness or conduct at any time before or during a trip is endangering or appears likely to endanger your health or wellbeing or any third party (including any other clients of the Company) or the safe, comfortable or happy progress of the trip, you may be excluded from all or part of the trip without refund or recompense. We may provide you with information (before departure and/or when you are on holiday) about transport, accommodation, activities and excursions which relate to or are available in the area you are visiting. We have no involvement in any such activities or excursions which are neither run, supervised, controlled nor endorsed in any way by us. They are provided by local operators or other third parties who are entirely independent of us. They do not form any part of your contract with us even where we suggest particular operators/other third parties and/or assist you in booking such activities or excursions in any way. We cannot accept any liability on any basis in relation to such activities or excursions and the acceptance of liability contained in the clause “Our liability to You” above will not apply to them. We do not however exclude liability for the negligence of ourselves or our employees resulting in your death or personal injury. We cannot guarantee accuracy at all times of information given in relation to such activities or excursions or about the area you are visiting generally or that any particular excursion or activity which does not form part of our contract will take place as these services are not under our control. If you feel that any of the activities or excursions referred to by us which are not part of our contract are vital to the enjoyment of your holiday, write to us immediately and we will tell you the latest known situation. If we become aware of any material alterations to area information and/or such outside activities or excursions which can reasonably be expected to affect your decision to book a holiday with us, we will pass on this information at the time of booking. If you have any special request, you must advise us at the time of booking. Although we will endeavour to pass any reasonable requests on to the relevant supplier, we regret we cannot guarantee any request will be met. Failure to meet any special request will not be a breach of contract on our part. Confirmation that a special request has been noted or passed on to the supplier or the inclusion of the special request on your deposit receipt or any other documentation is not confirmation that the request will be met. Unless and until specifically confirmed, all special requests are subject to availability. For your own protection, you should obtain confirmation in writing that a special request will be complied with (where it is possible to give this) where it is important to you. For Turkey, visas are easily obtained online at eVisa and must be purchased before you travel. Please check the passport validity requirements for entering Turkey. You may need to renew your passport before you travel. To enter Schengen countries (Greece and Italy) for up to three months your passport must be valid for the duration of the stay and no visa is required. We strongly recommend travelling with at least 6 months validity on your passport at all times. Requirements may change and you must check the up to date position in good time before departure. Nationals of other countries should ascertain whether visas are required in their case, and obtain them if they are. A full British passport presently takes approximately 2 to 6 weeks to obtain. If you or any member of your party is 16 or over and haven’t yet got a passport, our recommendation is that you should apply for one at least 6 weeks before your holiday. The UK Passport Service has to confirm your identity before issuing your first passport and will ask you to attend an interview in order to do this. If you or any member of your party is not a British citizen or holds a non-British passport, you must check passport and visa requirements with the Embassy or Consulate of the country(ies) to or through which you are intending to travel. Please note that some countries require a passport valid for 3-6 months after travel. A visa might not be issued if the passport is valid for less than six months after the date of your return. It is therefore essential to check and renew your passport in good time. All costs incurred in obtaining such documentation must be paid by you. We regret we cannot accept any liability if you are refused entry onto any transport or into any country due to failure on your part to carry all required documentation. If failure to have any necessary travel or other documents results in fines, surcharges or other financial penalty being imposed on us, you will be responsible for reimbursing us accordingly. There are presently no compulsory health requirements applicable to British citizens for your holiday. It is your responsibility to ensure you are aware of all recommended vaccinations and health precautions in good time before departure. Details are available from your GP surgery and from the National Travel Health Network and Centre www.nathnac.org Information on health is contained in the Department of Health leaflet T7 (Health Advice for Travellers) available from the Department of Health by telephone on 0870 1555455 or via its website www.dh.gov.uk and from most Post Offices. For holidays in the EU / EEA you should obtain an EHIC (European Health Insurance Card) prior to departure from the Department of Health (see leaflet T7 and the website www.dh.gov.uk). Health requirements and recommendations may change and you must check the up to date position in good time before departure. We consider adequate travel insurance to be essential. You should ensure that you have sufficient insurance to cover any medical treatment, repatriation, and/or cancellation charges, and property loss. Travellers who lack adequate insurance cover are responsible for indemnifying us in full of any such responsibilities and any losses or expenses arising out of your failure to take out adequate insurance cover. Please note that we recommend that you should organise travel insurance as soon as possible after booking as cover (including cancellation cover) will not be effective until you have paid all applicable premiums in full. We do not check insurance policies; however we request written details (insurer’s name, policy number and emergency contact number). Please read your policy details carefully and take them with you on tour. It is your responsibility to ensure that the insurance cover you purchase is suitable and adequate for your particular needs. You accept full responsibility for ensuring that all members of your party comply with the terms and conditions of the travel insurance purchased. Should you wish to make any changes to your confirmed tour or holiday arrangements, you must notify us in writing as soon as possible. Whilst we will endeavour to assist, we cannot guarantee we will be able to meet any such requests. Any change is subject to availability and also to payment of an administration fee of up to £30 per person and any associated costs of the change imposed by our suppliers. A change of tour dates will normally be treated as a cancellation of the original booking and rebooking in which case cancellation charges will apply. Changes may result in the recalculation of the holiday price where, for example, the basis on which the price of the original holiday was calculated has changed. If any member of your party is prevented from travelling, the person(s) concerned may transfer their place to someone else (introduced by you) providing we are notified not less than 30 days before departure. This right of transfer is subject to an administration fee of £30 per person. The person prevented from travelling and the transferee shall be liable to us. For the payment of the balance, together with any additional charges imposed by the suppliers providing the component parts of your holiday. Should you or any member of your party need to cancel your holiday once it has been confirmed, the lead booker must immediately advise us in writing. Your notice of cancellation will only be effective when it is received in writing by us at our offices. As we incur costs from the time we confirm your booking, the cancellation charges will be payable. Where the cancellation charge is shown as a percentage, this is calculated on the basis of the total cost payable by the person(s) cancelling excluding amendment charges. Amendment charges are not refundable in the event of cancellation. The following cancellation charges will be payable unless we advise you in writing of different cancellation charges applicable to your tour at the time of booking. In addition to the cancellation charges an administration fee of £30.00 per person cancelling will be payable. Where any cancellation reduces the number of full paying party members below the number on which the price, number of free places and/ or any concessions agreed for your booking were based, we will recalculate these items and re-invoice you accordingly. This may mean, for example, that the individual price per person increases if the total number of persons travelling on your booking decreases. As set out above the lead booker is responsible for making all payments due to us and we will only make any payments due to you in respect of your booking to the lead booker even if you paid us directly. We will make every effort to operate the specially arranged tours according to the descriptions and itineraries described. Although it is unlikely that we will have to make any changes to your travel arrangements or cancel confirmed arrangements, we must reserve the right to do so should it become necessary or advisable. However, we promise we will only cancel your confirmed booking after you have made full payment where we are forced to do so as a result of circumstances outside our control “force majeure” as defined in below or lack of minimum numbers. We will not cancel after this date for any other reason. Please note our holidays require a minimum number of participants to enable us to operate them. If the minimum numbers of bookings required for a particular holiday have not been received, we are entitled to cancel it. We will notify you of cancellation for this reason no later than 10 weeks before departure. Where a change is a minor change, we will, if practical, advise you before departure, but we are not obliged to do so. Most changes are minor but occasionally we have to make a significant change. A significant change is a change made before departure which, taking account of the information you give us at the time of booking and which we can reasonably be expected to know as a tour operator, we can reasonably expect to have a major effect on your holiday. If we make a significant change to your holiday we will inform you as soon as reasonably possible if there is time before your departure. Examples of significant changes include a change to a lower standard of accommodation for the whole or a major part of your holiday or a significant change to the itinerary. Please note that these are examples only and there may be other changes which are considered major. You will then have the choice of either accepting the change, or take an alternative holiday (paying or receiving a refund / credit in respect of any price difference) or cancelling your booked holiday and receiving a full refund of monies paid. In the unlikely event that we become unable to provide a significant proportion of your trip after you depart, we will make alternative arrangements for you to continue your holiday. If this is impossible, or you do not accept these alternative arrangements for a good reason, we will pay you compensation of an amount which is reasonable taking into account all the circumstances. Compensation will not be considered appropriate, for example, in cases where we are unable to provide your contracted holiday services as a result of force majeure or because of lack of numbers. No compensation will be payable and the above options will not be available if we cancel as a result of your failure to comply with any requirement of these booking conditions entitling us to cancel (such as paying on time) or where a change is a minor one. Except where otherwise expressly stated in these booking conditions, we regret we cannot accept liability or pay any compensation where the performance or prompt performance of our obligations under our contract with you is prevented or affected by or you otherwise suffer any damage, loss or expense of any nature as a result of force majeure. In these booking conditions force majeure means any event which we or the supplier of the service or services in question could not, even with all due care, foresee or avoid. Such events may include but are not limited to war, riot, civil strife, terrorist activity, industrial dispute, natural or nuclear disaster, closure of airports, technical problems with transport, adverse weather conditions, fire, strikes and all similar events outside our control whether these events are threatened or actual. All of the information contained in our brochure, on our website and in our other advertising materials has been provided in good faith, and is considered to be correct at the time of publication. However, occasional errors may occur, and information may subsequently change. You must therefore ensure you check all details of your chosen tour (including the price) with us at the time of booking. It is your responsibility to inform us of any and all special dietary requirements that you may have. In particular, we must be informed in advance of any and all food intolerances or allergies. We will make every attempt to ensure that the meals served on our tours contain elements that comply with your dietary requirements, but this may not always be possible. As many of our tours are Maritime Voyage holidays, it will often not be possible to source alternative foods for you from Day 1 of the tour, and you should therefore ensure that you have a suitable stock of alternative products with you. Please contact us for further information about the kind of foods served on our various tours. In the unlikely event you have reason to complain, you must inform our tour leader or local representative and the supplier of the service(s) in question immediately who will do all possible to resolve the matter on location. If something does go wrong we will do our best to put it right. We strive to ensure you are satisfied with our services. However, if our tour leader or local representative are unable to help and the problem is not resolved to your satisfaction by the supplier, you must contact us in the UK, giving us full details and a contact number. Until we know about a complaint or problem, we cannot begin to resolve it. Most problems can be dealt with quickly. If you remain dissatisfied, however, you must give details in writing to our local representative and the supplier concerned at the time and write to us giving full details of your complaint within 28 days after the completion of the tour. Failure to take these steps may hinder our ability to resolve the problem and/or investigate it fully and in consequence, your rights under the contract may be affected. We regret we cannot accept liability if you fail to notify the complaint or claim strictly in accordance with this clause. Disputes arising out of, or in connection with this contract which cannot be amicably settled may be referred to arbitration if you so wish. We can offer you ABTA’s scheme for the resolution of disputes which is approved by the Chartered Trading Standards Institute. If we can’t resolve your complaint, go to www.abta.com to use ABTA’s simple procedure. Further information on the Code and ABTA’s assistance in resolving disputes can be found on www.abta.com. You accept responsibility for the proper conduct of yourself and any or all other members of your group. We reserve the right in our reasonable discretion to terminate your holiday or that of any member of your group whose conduct is considered to be disruptive or detrimental to the enjoyment of other guests, or whose conduct may prejudice our reputation. In this case we shall have no further responsibility or liability to you. No refund or payment of any costs incurred by you will be made by us under these circumstances. Your booking is accepted on the understanding that you realize the potential hazards involved in Maritime Voyage holidays, particularly in consideration of cruising and staying on board an operating boat. Children (and all persons under 18 years) should be supervised at all times by Parents or Guardians. This is not the responsibility of crew members or the tour guide/tour manager. We promise to make sure that the holiday arrangements we have agreed to make perform or provide as applicable as part of our contract with you are made, performed or provided with reasonable skill and care. This means that, subject to these booking conditions, we will accept responsibility if, for example, you suffer death or personal injury or your contracted holiday arrangements are not provided as promised or prove deficient as a result of the failure of ourselves, our employees, agents or suppliers to use reasonable skill and care in making, performing or providing, as applicable, your contracted holiday arrangements. Please note, it is your responsibility to show that reasonable skill and care has not been used if you wish to make a claim against us. Standards of, for example, safety, hygiene and quality vary throughout the transport and destinations that your holiday may involve. Sometimes these standards will be lower than those which would be expected to be found in the UK. In addition, we will only be responsible for what our employees, agents and suppliers do or do not do if they were at the time acting within the course of their employment (for employees) or carrying out work we had asked them to do (for agents and suppliers). We will not be responsible for any injury, illness, death, loss (for example loss of enjoyment), damage, expense, cost or other sum or claim of any description whatsoever which results from any of the following: – the act(s) and/or omission(s) of the person(s) affected or any member(s) of their party or the act(s) and/or omission(s) of a third party not connected with the provision of your tour and which were unforeseeable or unavoidable or ‘force majeure’ as defined above. Please note we cannot accept responsibility for any services which do not form part of our contract. This includes, for example, any additional services or facilities or excursions which a hotel or any other supplier or any of our local contacts agrees to provide for you where the services or facilities are not advertised by us and we have not agreed to arrange them as part of our contract. For any additional excursion, activity or tour you book whilst on holiday, your contract will be with the operator of the excursion, activity or tour and not with us. We are not responsible for the provision of the excursion, activity or tour or for anything that happens during the course of its provision by the operator. In addition, regardless of any wording used by us on our website, in any advertising material or elsewhere, we only promise to use reasonable skill and care as set out above and we do not have any greater or different liability to you. The promises we make to you about the services we have agreed to provide or arrange as part of our contract – and the laws and regulations of the country in which your claim or complaint occurred – will be used as the basis for deciding whether the services in question had been properly provided. If the particular services which gave rise to the claim or complaint complied with local laws and regulations applicable to those services at the time, the services will be treated as having been properly provided. This will be the case even if the services did not comply with the laws and regulations of the UK which would have applied had those services been provided in the UK. The exception to this is where the claim or complaint concerns the absence of a safety feature which might lead a reasonable holiday maker to refuse to take the tour in question. Please note, however, our obligation is to exercise reasonable skill and care as referred to in paragraph (1) above. We do not make any representation or commitment that all services will comply with applicable local laws and regulations and failure to comply does not automatically mean we have not exercised reasonable skill and care. As set out in these booking conditions, we limit the maximum amount we may have to pay you for any claims you may make against us. Where we are found liable for loss of and/or damage to any luggage or personal possessions (including money), the maximum amount we will have to pay you is £500 per person affected unless a lower limitation applies to your claim under this paragraph (5) or paragraph (6) below. You must ensure you have appropriate travel insurance to protect your personal belongings. For all other claims which do not involve death or personal injury, if we are found liable to you on any basis the maximum amount we will have to pay you is twice the price (excluding amendment charges) paid by or on behalf of the person(s) affected in total unless a lower limitation applies to your claim under sub-section (6) below. This maximum amount will only be payable where everything has gone wrong and you have not received any benefit at all from your tour. Where any claim or part of a claim (including those involving death or personal injury) concerns or is based on any travel arrangements (including the process of getting on and/or off the transport concerned) provided by any air, sea, rail or road carrier or any stay in a hotel, the maximum amount of compensation we will have to pay you will be limited. The most we will have to pay you for that claim or that part of a claim if we are found liable to you on any basis is the most the carrier or hotelier concerned would have to pay under the international convention or regulation which applies to the travel arrangements or hotel stay in question (for example, the Athens Convention for international travel by sea (as amended by the 2002 protocol where applicable) and COTIF, the Convention on International Travel by Rail). Please note: where a carrier or hotelier would not be obliged to make any payment to you under the applicable international convention or regulation in respect of a claim or part of a claim, we similarly are not obliged to make a payment to you for that claim or part of the claim. When making any payment, we are entitled to deduct any money which you have received or are entitled to receive from the carrier or hotelier for the complaint or claim in question. Copies of the applicable international conventions and regulations are available from us on request. Please note, we cannot accept any liability for any damage, loss, expense or other sum(s) of any description which (1) on the basis of the information given to us by you concerning your booking prior to our accepting it, we could not have foreseen you would suffer or incur if we breached our contract with you or which (2) did not result from any breach of contract or other fault by ourselves or our employees or, where we are responsible for them, our suppliers. Additionally we cannot accept liability for any expenses or losses which relate to a business (including self-employed loss of earnings). You must provide ourselves and our insurers with all assistance we may reasonably require. You must also tell us and the supplier concerned about your claim or complaint as set out in the clause “Complaints” above. If asked to do so, you must transfer to us or our insurers any rights you have against the supplier or whoever else is responsible for your claim or complaint (if the person concerned is under 18, their parent or guardian must do so). You must also agree to cooperate fully with us and our insurers if we our insurers want to enforce any rights which are transferred. Many of the services which make up your holiday are provided by independent suppliers. Those suppliers provide these services in accordance with their own terms and conditions. Some of these terms and conditions may limit or exclude the supplier’s liability to you, usually in accordance with applicable international conventions (see clause above). Copies of the relevant parts of these terms and conditions and of the international conventions are available on request from ourselves or the supplier concerned. ABTA: We are a Member of ABTA, membership number Y6151. We are obliged to maintain a high standard of service to you by ABTA’s Code of Conduct. We provide full financial protection for our package holidays, by way of a bond held by ABTA. We have no connection with any airline and suggest making reservations directly with the airline, online or with a flight specialist. Airport transfers on the first and last day of the scheduled tour are included in the cost of your booking. If you are arriving or leaving on different days you will need to make your own arrangements regarding transfer to or from arrival and departure airports. If you arrive late, we will do our best to enable you to join the tour at a convenient time and place but cannot make any guarantees that you will be able to.